​ The Pythagorean theorem. Subject-verb agreement. Commas, colons and semi-colons. These are some of the topics that were tackled during a series of SAT preparation workshops sponsored in May 2018 by CollegePath LA. 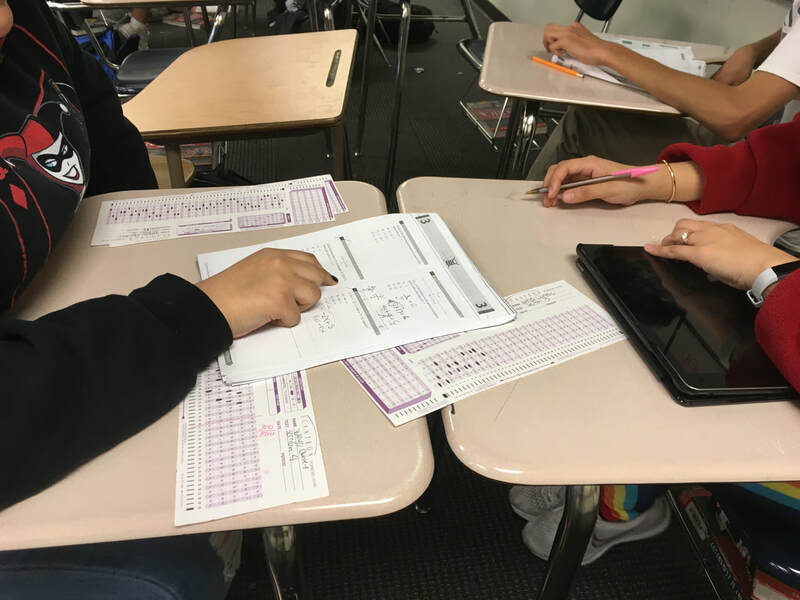 About 50 students and 15 volunteer tutors participated in the program, which included practice tests at John Marshall High School on four successive Saturdays. On the following Tuesdays and Thursdays, students received their results and huddled with tutors to figure out their mistakes. “The single best thing kids can do is to take practice tests,” says Nick Cherneff, a Los Angeles screenwriter and a former professional SAT/ACT tutor. “The SAT is a marathon-style endurance test. You can’t just show up and expect to do well,” he adds. Nick and his friend, Flynn Berry, spearheaded the Marshall program. Nick learned of CollegePath LA through a local podcast interview with executive director Susan Philips. He had recently moved from New York and was exploring volunteer opportunities in his new community. When he reached out to Susan the conversation eventually turned to test preparation. For its part, CollegePath LA had for many years wanted to help students with this application hurdle, but wasn’t sure how. Nick and Flynn were the answer! They proposed an intensive month-long testing and tutoring blitz that met with the enthusiastic approval of Marshall’s principal and its college counselor. “Marshall kids have been a revelation. I’m blown away by how smart and dedicated they are. Kids are self-motivated and eager to get better,” Nick says. During his 10 years as a professional tutor, he worked with many affluent kids who were dragged to him by their parents. 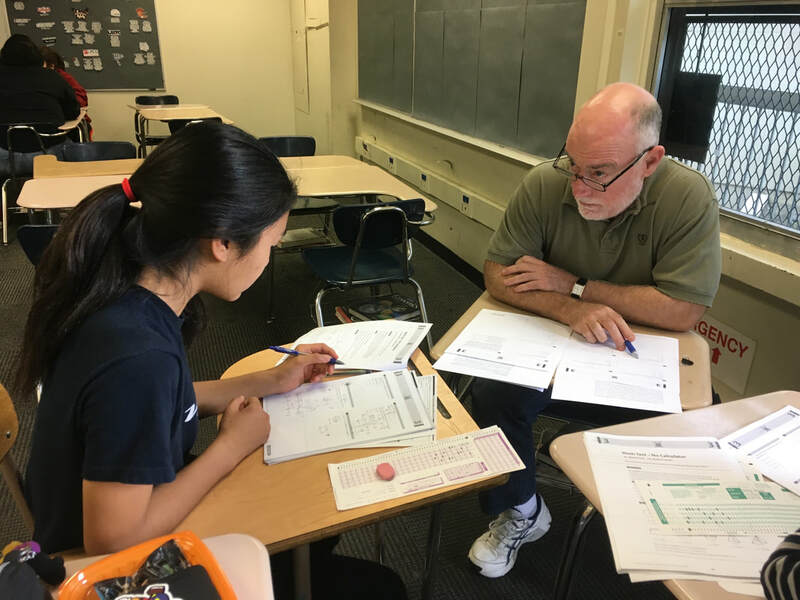 Each of the four practice tests, proctored by CollegePath LA volunteers on Saturday mornings, drew between 25 and 35 students. A core group of about 20 took two or more tests. 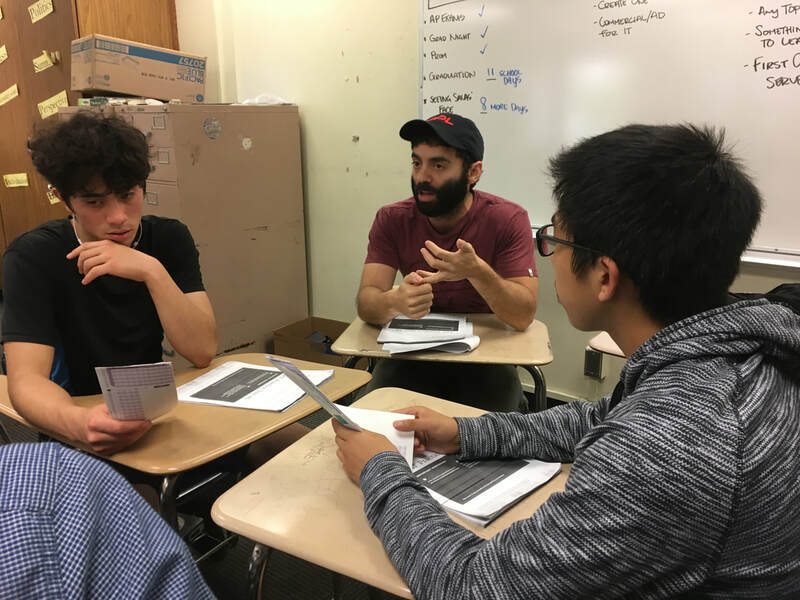 On Tuesdays and Thursdays after school, Nick, Flynn and the volunteers worked with students in small groups, or one-on-one. Flynn recruited a few experienced tutors from a local test prep company. The students’ appreciation was heartening. In surveys, completed after the program ended, the participants enumerated some of the strategies and tips they learned. They also said they felt much more confident about taking the test, an important psychological ingredient in a successful outcome. Next year, CollegePath LA hopes to offer students a longer runway by starting test prep earlier in the year. The program could start with a diagnostic test that would help students identify their strengths and weaknesses. Also under consideration is a “boot camp” for volunteers to help them improve their tutoring skills. Increasing students’ exposure to a variety of college campuses has long been a goal of John Marshall High School’s college counselor, Tricia Bryan. “Many students have applied to colleges close by and never visited them,” she says. 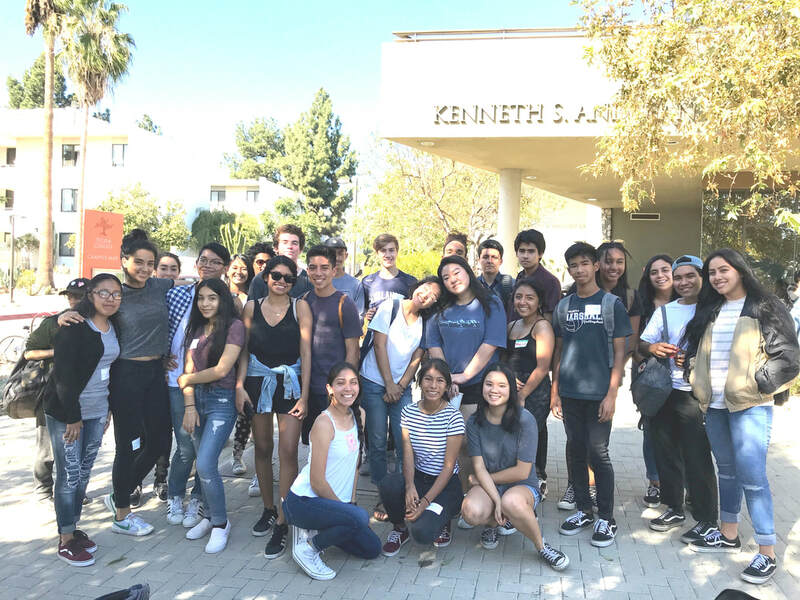 To facilitate campus tours, CollegePath LA has raised funds to sponsor monthly bus trips to colleges in southern California. Since October, Mrs. Bryan has escorted groups of 25 to 40 students to Cal Poly Pomona, Pitzer College, Cal State Dominguez Hills and UC Irvine. The trips have made a difference. They confirmed some students’ interest in applying. One student decided to apply to Pitzer after attending an “open house” for prospective students, Mrs. Bryan says. UC Irvine became the “first choice” school of one student visitor. Logistics, including traffic, are challenging. The first outing to Cal Poly Pomona was rushed because the trip took longer than expected. Most tours have been on Friday mornings, but some have been longer, and included lunch. At Pitzer, the open house included free food, a dorm room tour, and talks on admissions and financial aid. At UC Irvine, CollegePath LA paid for lunch in a dorm cafeteria. Mingling with students over a meal offers an authentic taste of college life. At UC Irvine, a highlight was encountering students in the cafeteria who were Marshall graduates. After lunch, when it was time to board the bus back to Marshall, Mrs. Bryan says she momentarily forgot that the alumni weren’t leaving with them! At Cal State Dominguez Hills, students were awarded T-shirts and pens for correctly answering questions after the tour. Older parts of the college lack greenery and open space, but new construction is transforming the campus. Students were especially impressed with “Manifest Destiny,” a magnificent mural that celebrates a multiethnic view of American history. More field visits are on the drawing board, including a large group outing to the college fair in Pasadena on April 26. CollegePath LA aims to eventually help prospective students visit colleges in other parts of California, and out of state. “My mission since I started this job was to expand the number of colleges that students apply to and attend,” Mrs. Bryan says. Sheryl Mixey, a John Marshall High School alumna, lives in a remote rural community in eastern Washington. On Palm Sunday every year, her ladies’ club hosts a ham dinner to raise money for high school scholarships. “We usually raise about $1,000,” she says. Last year, however, no high school senior applied for the money. This was distressing because scholarships are sorely needed. Nearly three-quarters of the 150 students at the local K-12 school are low income and qualify for free breakfast and lunch. Sheryl set out to learn more about college admissions and scholarships. Her research brought her to the website of CollegePath LA, which helps students navigate the college application process at her alma mater. Sheryl quickly realized that her club needed a more proactive approach. “I can definitely understand how a low-income family can think it is impossible to send a child to college. We need to instill hope in the minds of the students and their families,” she says. She contacted CollegePath LA and talked for more than an hour with Susan Philips. Her “enthusiasm rubbed off on me,” Sheryl says. Sheryl, in turn, spread that enthusiasm to a senior at the local high school. “He was a little discouraged because he is practically homeless, staying here and there with friends and classmates, she says. Despite a high SAT score and a 4.0 GPA, the student hadn’t received much guidance towards college or financial aid. Sheryl stepped up. She encouraged him to apply to a university and told him about the FAFSA (Free Application for Federal Student Aid). Now he has been accepted to Washington State University (WSU) and has $4,000 in aid to start. “He is very excited about applying for other scholarships and has a different outlook about everything now,” she says. This summer I was a teaching fellow for Generation Teach Summer Academy, a seven-week education program in Denver, Colorado. After two weeks of training, I taught 6th grade reading three times a day and was an advisor to three students. Generation Teach challenged me to work hard. I discovered that teachers’ responsibilities don’t end when the students go home; there are lessons to be planned and student responses to be read. I was tired a lot but never had I felt so happy and tired at the same time. Teaching boosted my self-confidence. Initially, I questioned whether I could be the leader my students needed, but with practice I developed my teacher presence and learned how to lead a class. Experienced teachers observed each fellow’s class at least twice a week, followed by a coaching conference. Seeing my students learn as a result of my teaching helped me believe in myself. I heard about the fellowship from a friend who was accepted into Generation Teach at its other site in Boston. I applied because I’m interested in a career in education and I wanted to know if I would like teaching. In Denver, there were 60 fellows divided between two public middle schools. Most fellows were college students or recent graduates. The fellowship is also open to high school students after their sophomore year. The program included a $2,100 stipend and free housing located at an apartment about 20 minutes from downtown Denver. I used my stipend to pay for my plane ticket, groceries and other expenses. There were plenty of memorable moments this summer. One of them occurred one afternoon when a student came into class upset after his previous class. He said he had a hard time grasping the material and felt like he was not as smart as the other students. In his hand, he held a note he had written, full of self-deprecating remarks. The other students noticed that he wasn’t his usual self and asked him what was wrong. When they saw the note, they immediately responded. They told him he is an intelligent, funny person and that they enjoy being in class with him. It was a special moment where the class came together to comfort him and let him know that they valued him. It was then that I realized we had become a community. I enjoyed getting to know my students. They were funny, insightful and though some misbehaved in my class, they were all sweet and eager to read. I think that the people around you can make or break an experience. The bonds I formed with my students and colleagues at Generation Teach are what made this summer unforgettable.